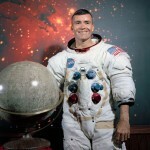 Full Name: Fred Wallace Haise, Jr. Note: The moon landing was aborted due to an explosion in the service module, the crew returned safely to Earth. Haise would have been the 6th man to walk on the moon. 1952, Naval Aviation Cadet at Pensacola, Florida. March 1954 to September 1956, USMC fighter pilot at Cherry Point, North Carolina. March 1957 to September 1959, Fighter-Interceptor pilot with the Oklahoma Air National Guard. August 1962, Outstanding Graduate, USAF Aerospace Research Pilot School. September 1959 to March 1963, Research Pilot at NASA’s Lewis Research Center, Cleveland, Ohio. 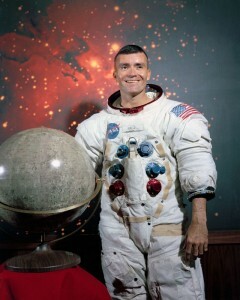 April 11-17, 1970, Lunar Module Pilot on the ill-fated Apollo 13 mission. He and crewmates Jim Lovell & Jack Swigert were forced to use their Lunar Module “Aquarius” as a lifeboat during a life and death struggle to return to Earth after an explosion in the Service Module of the CSM “Odyssey”. April 1973 to January 1976, Technical Assistant to the Manager of the Space Shuttle Orbiter Project at Johnson Space Center, Houston, Texas. June to October 1977, CDR of Crew 1 for the STS Approach & Landing Tests aboard the Space Shuttle “Enterprise” at Edwards AFB, California. 1979, Vice-President, Space Programs, Grumman Aerospace Corp., working in the Space Station Support Division. 1995, portrayed by actor Bill Paxton in the Ron Howard film “Apollo 13”. Later (as of 1996), President, Grumman Technical Services Inc., Titusville, Florida, and President, Northrop Worldwide Services, Lawton, Oklahoma.